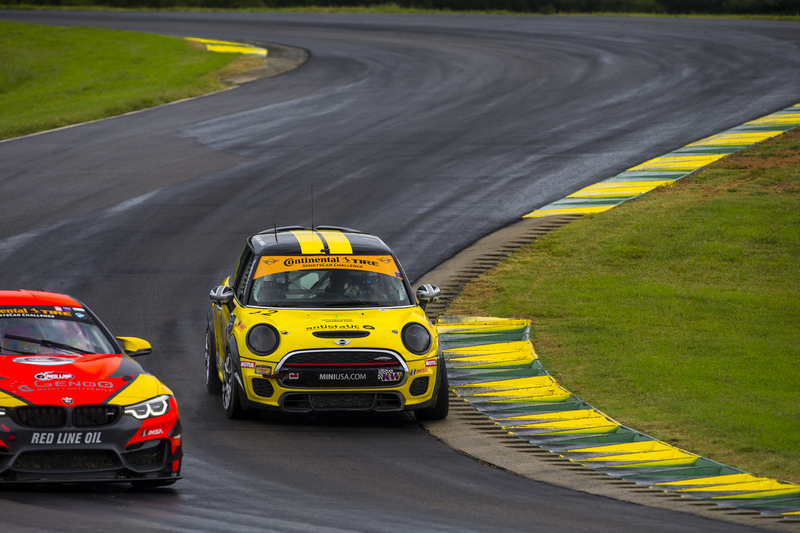 Virginia International Raceway hosted round eight of the Continental Tire SportsCar Challenge. The two-hour Biscuitville Grand Prix proved to be an exciting race with everything from door to door battles to inclement weather. 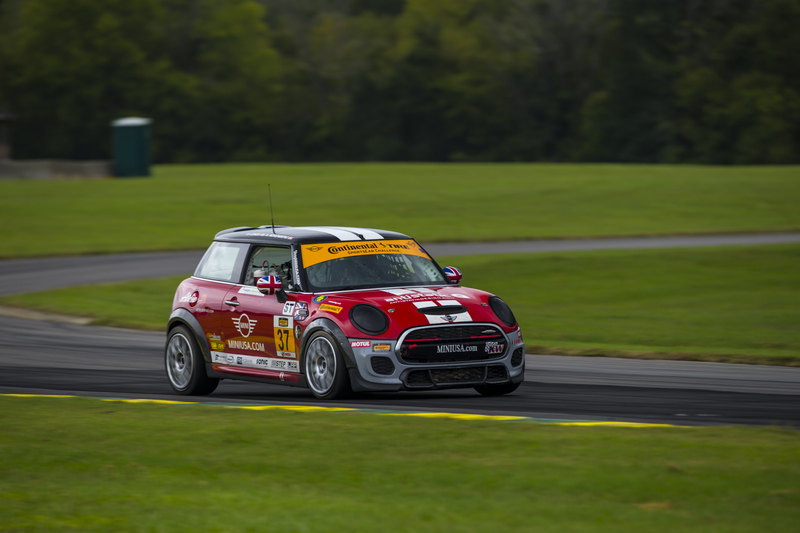 Team owner Luis Perocarpi was hoping for rain at VIR. He felt wet conditions would really favor the MINIs, and it didn’t take long for Mother Nature to answer his call. Five minutes into the event heavy rain began to fall, and the MINIs handled it without issue while the competition slid off track. Colin Mullan in the 52 took advantage of the situation; completely eliminating an eight second gap between himself and the 81 BMW. The two had an epic battle, swapping the lead multiple times. Mike LaMarra drove the opening stint in the 73 MINI JCW. LaMarra was able to take advantage of the track conditions as well, keeping the first place battle within view. Eventually LaMarra found his way around Mullan; moving into the lead for a period of time before pitting. The Biscuitville Grand Prix ran caution free. Shortly after the leading BMW pitted for rain tires the 52 and 73 came in for their stops. 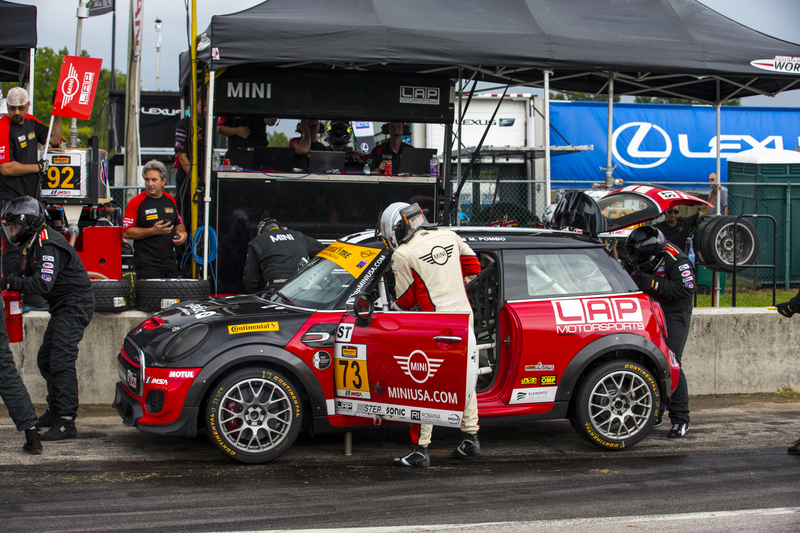 The MINI JCW Team continued to show that they have one of the best pit crews in the series. Performing flawless stops and getting the 52 and 73 out in front of the 81. Not only did they exit the pits out in front with a 25 second lead but the team engineers, led by Rob Ridgely, opted to dare Mother Nature by continuing the second stint on slick tires. Nate Norenberg pitted shortly thereafter. Norenberg had an outstanding first stint, exchanging track position with his teammates as they battled for the lead. The 37 held the lead briefly before pitting to hand the car off to Derek Jones. Once again, the team’s engineering staff had to make a daring call, and decided to keep the 37 car on the same strategy as the 81 BMW in an effort to secure a good finishing position if Mother Nature accepted the challenge. Mat Pombo was now in the 73 and was clearly in control of the race. Brother Mark Pombo was close behind in second, and thanks to another blistering fast pitstop from the crew, the 37 was in third as Derek Jones literally burned the Continental rain tires off the car to complete the MINI 1-2-3 running order. With 30 minutes left in the race the 73 suffered steering rack failure, caused by contact with a TCR car during LaMarra’s stint, forcing Mat’s pace to slow considerably and taking him out of podium contention. Derek Jones closed out the race with an exciting finish. The 37 lost second place by the nose of the 21 Porsche who was pushed across the finish line by a GS car. An unfortunate miscalculation lead to Jones only accumulating 44 minutes of drivetime, when a minimum of 45 minutes is required. A penalty was issued post race, dropping the 37 from the podium. Mark took over the lead when the 73 was no longer in contention for the win. After a brilliant call by the team engineers, coupled with the extraordinary handling of the MINIs during poor weather conditions, Mark found himself with a staggering gap; not something you often see in the series. As the 52’s race wound down, it suddenly encountered electrical gremlins forcing Mark to nurture the car to the finish line. The huge lead he had was whittled down to 15 seconds by the final lap, but he was able to hold on and cross the line in first place. What looked like Mark’s third and Mullan’s second victory was not meant to be. A post-race inspection discovered a boost infraction on the 52, and they were sent to the rear of the class. 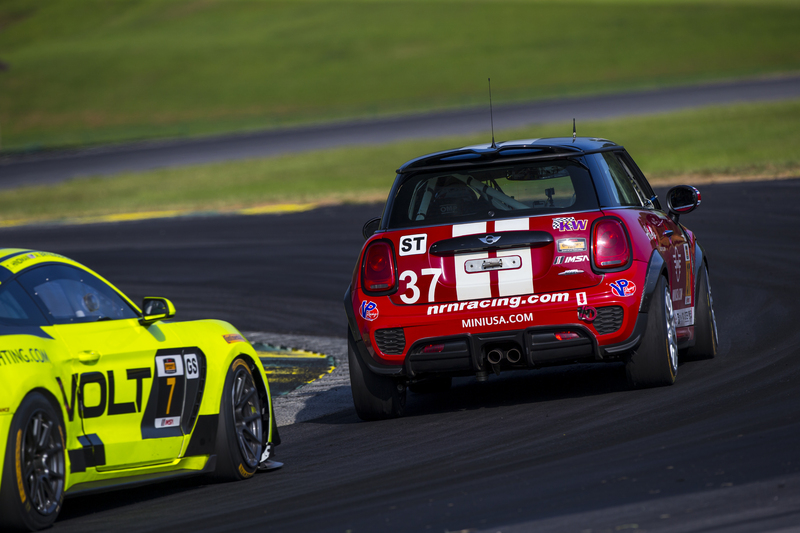 Despite the difficulties in this race the team continues to have MINI in the lead for the manufacturers championship. With two races to go and only a point separating them from second place BMW, it’s going to be an exhilarating fight to the finish. Next up on the calendar is the two-hour event at WeatherTech Raceway Laguna Seca on September 8th. Results for the rest of the field can be found here.